Your most generous gift today will help feed and care for severely malnourished children so that no child suffers needlessly. Our Christian ministry partners care for the most vulnerable children in the world. In Guatemala, Hope of Life, sends rescue teams into poor, remote villages to find the most malnourished children, who will die if they don’t receive immediate aid. 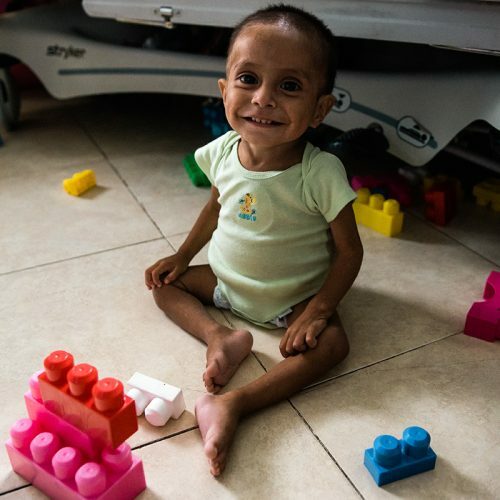 These emaciated children are rushed to the ministry’s 24-hour hospital located at their main facility. At the hospital, the children are provided with a full medical examination and blood tests. They receive the food, medicine and expert care they desperately need. The children and parents also meet with a nutritionist and social worker. The program continues to monitor the children’s health and provides free medical consultations after they return home to their families. A gift today through Cross International toward the nutrition centers in Guatemala and other regions of the developing world, will help feed severely malnourished children and restore them to complete health.